Mercator Gold Plc (“Mercator“ or the “Company”) (MCR.L) is pleased to announce that it will start to produce gold in June 2007 from the Company’s operations near Meekatharra, Western Australia, with a first year target of 120,000 ounces of gold. First production will be from the Surprise open pit where the probable ore reserve of 75,000 ounces will be mined over a 7 month period. Ore will be transported for treatment to the nearby Yaloginda CIL plant, which has been re-commissioned by Mercator and has the capacity to treat between 1.2 to 3 million tonnes per year of ore, depending on the hardness of the rock. Second stage production will come from the neighbouring Prohibition-Vivian-Consols mining area (PVC) which currently contains 380,000 ounces of indicated resource. Ongoing drilling and resource modelling of the PVC deposit has given the company greater confidence in the resource quality and shown the potential for a considerable increase in its size. The resource evaluation, mining optimisations, open pit design and production scheduling of the Surprise deposit is now complete and has been approved by the Board. The independent, revised resource evaluation prepared by Cube Consulting Pty Ltd is a 320% increase in gold in the indicated category, now standing at 3.6Mt at 1.13g/t for 130,900 ounces uncut (or 108,900 ounces cut). Full details including a resource statement are included in an accompanying document that will be posted on the company web site. The ore reserve for the optimal open pit, based upon a gold price of A$750 per ounce, is 992,000 tonnes at 2.36g/t for 75,300 ounces gold. The open pit will produce gold at a cash cost of A$ 342/oz. (U.S $260/OZ). The Surprise Pit Optimisations and final Pit design has been based on current open pit mining practices. Mining dilution 10% and ore recovery of 95%, Metallurgical test work confirming recoveries of 93% to 95% from ore with Bond Mill Work Index of 12 to 15 kwhrs /tonne. The optimal open pit at A$750 per ounce is 992,000t @ 2.36g/t for 75,293oz. The pit has a strip ratio of 5.6:1 and a net cash cost per ounce of A$342. The Surprise Pit is located within 100 meters of a major public highway. As a cut back is required to take this pit deeper the highway has to be diverted to meet safety codes. Tenders and approvals from statutory authorities have been received to execute this work. Production from the Surprise pit, taking into account the high nugget effect of the Surprise ore body, the cut and uncut grade models and after accounting for mining dilution and recovery factors is expected to produce between 60,000 and 68,000 ounces of gold. This production should occur over a 6-7 month period. The fuller potential of the Prohibition area of the PVC deposit is now apparent as the programme of resource definition drilling nears completion. Resource estimates for Prohibition and Vivian-Consols are well advanced and are due to be completed over the next eight weeks. Mining studies and optimisation of the various ore bodies are ongoing and are due for completion in June 2007. The current plant refurbishment programme remains on schedule. Progressive commissioning of all the plant components, such as crushing and stacking, grinding, leaching, gold elution to bullion, will commence in late March 2007 and will place the plant in full readiness for gold production by June 2007. 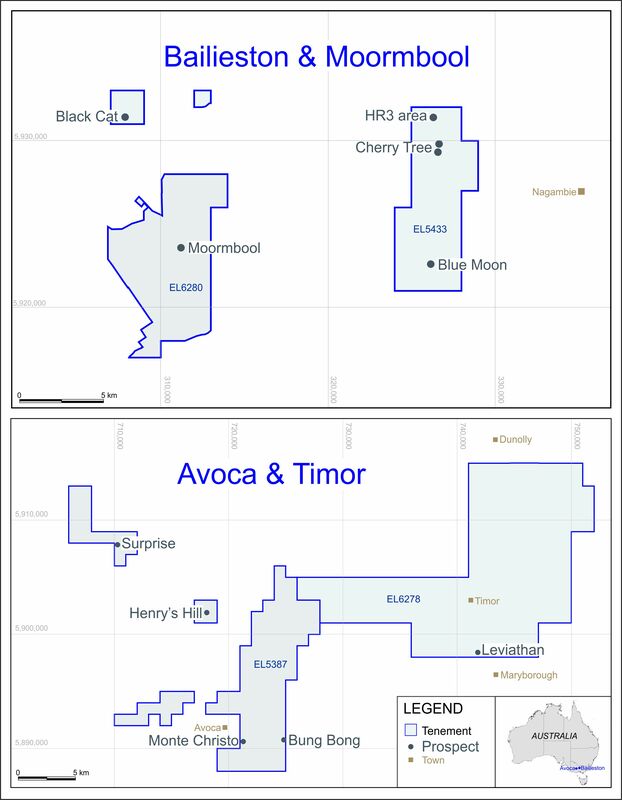 The independent resource evaluation was completed by Cube Consulting Pty Ltd under the supervision of Patrick (Rick) Adams BSc, MAusIMM, MAIG, a director of Cube and Ruth Jupp BSc, MAIG, a senior consultant geologist for Cube. Rick Adams and Ruth Jupp both have sufficient experience that is relevant to the style of mineralisation and type of deposit under consideration and to the activity that is undertaken to qualify as the Competent Person as defined in the JORC Code 2004 Edition. Mr Denis Geldard Mining Engineer AWASM, MAusIMM, the Company’s Operations Director, is a competent person as defined under the JORC Code 2004 consents to the Reserve computations.